Your Best Choice of Small Water Storage Containers for Long term Storage. 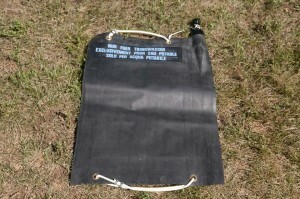 Here is the US 5 gallon water can with the insulated bag. 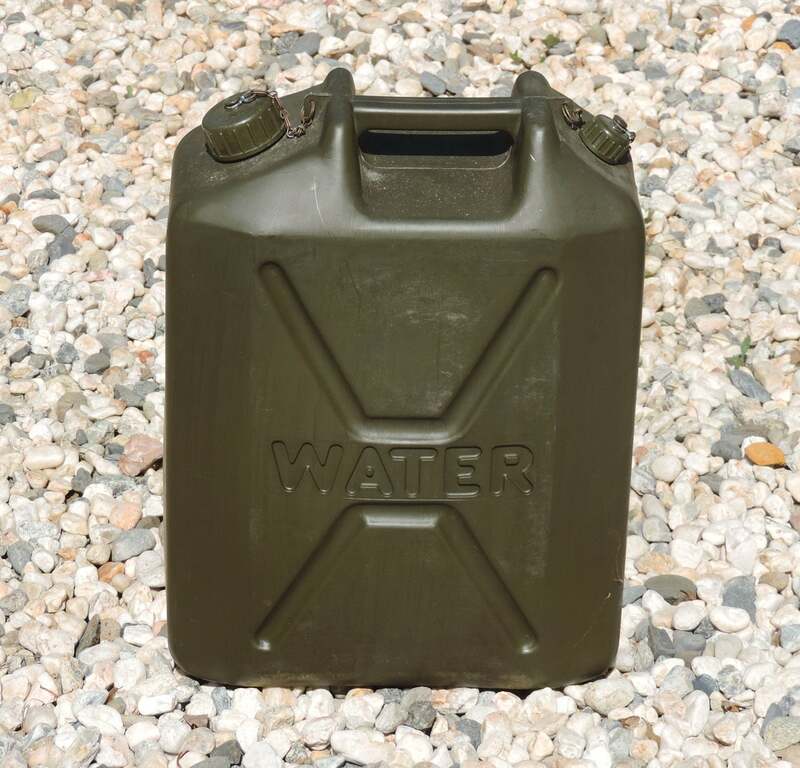 Recently I have received several inquiries regarding the best type of small water storage containers to use for long-term water storage. 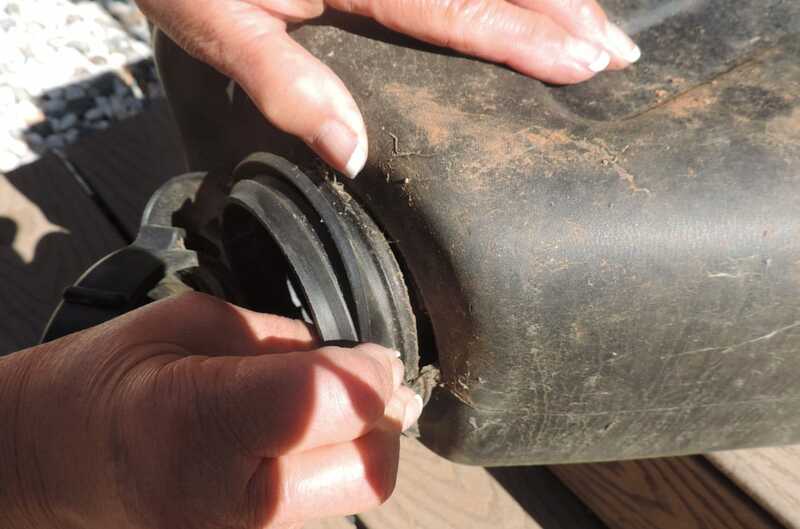 Over the years, I have tried many different types of water storage containers and have found some that did not work well. This post will only deal with 5-gallon or smaller containers. Good examples of poor containers are milk and chlorox bottles. The milk bottle deteriorates in a relatively short period of time regardless of how you store them. Water from Clorox bottles always has a strong chlorine taste, regardless of how well you clean the bottles or how long it has been stored. For small water storage containers soda and some of the better quality plastic juice bottles work well. Just be sure and clean them well before you use them. I have a friend who has been filling them and throwing them in the crawl space under his house for years and they all seem to be in good shape. Now for us this doesn’t work, we buy almost no soda or juice in bottles. We drink soda maybe once or twice a year when someone comes over. So over the years I have tried all different types of containers. The square commercial 5-gallon water containers like the Coleman’s work OK, but they are not as strong as I like. 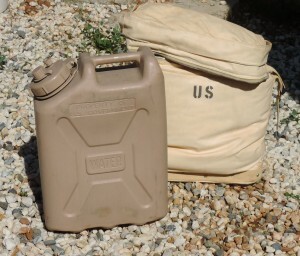 My favorite and which are getting harder to get at a good price are the US and British Military 5 gallon containers. The US 5-gallon Secpter style cans work great. They are strong and will take a lot of damage. A few years ago, I purchased a number of them from a wholesale surplus outfit. I got them at a good price even through there was a few damaged ones. In examining them, the damage almost always seems to be to the lid or the bottom of the threats. I tried to repair a few of them, but could never find glue that would work with them. There still are a few damaged ones around and if you have any ideas on how to fix them, let me known, and I will see if it works. The reason I kept the damaged ones is that the 4-inch lid opening makes them easy to fill from a stream. There is a stream across from my house and I figured they would be useful to carry dirty water to my garden. Here you can see the crack at the bottom of the threads. Always check this area when you go to buy a can. The cracks can be very hard to see. Also check the lids for damage. The military makes a insulated bag that is designed to work with these cans to keep the containers either hot or cold. A few of these can be useful. The British 5 gallon can is a good one, my only complaint is that I wish the fill hole was bigger. The British make a similar five-gallon water container. The big difference is that the fill opening is smaller and they are harder to fill from a stream. Other than that, they are the equal of the US cans and will fit in the US insulated bags. 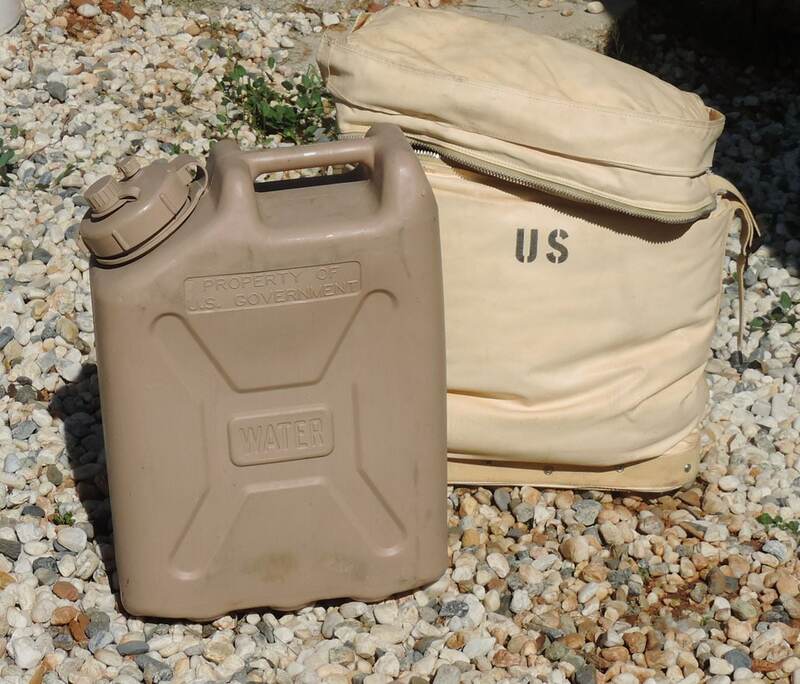 The military water storage containers are the best if you can afford them, they can be a bit pricey. If you can’t afford them, use the best you can afford, but store water. This entry was posted in water purification and tagged water storage container. Bookmark the permalink. 4 Responses to Your Best Choice of Small Water Storage Containers for Long term Storage. 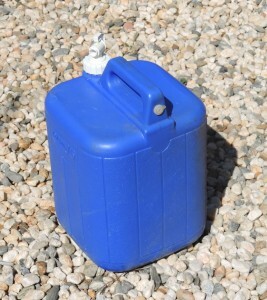 Scepter also makes 5L (2.5gal) water containers. 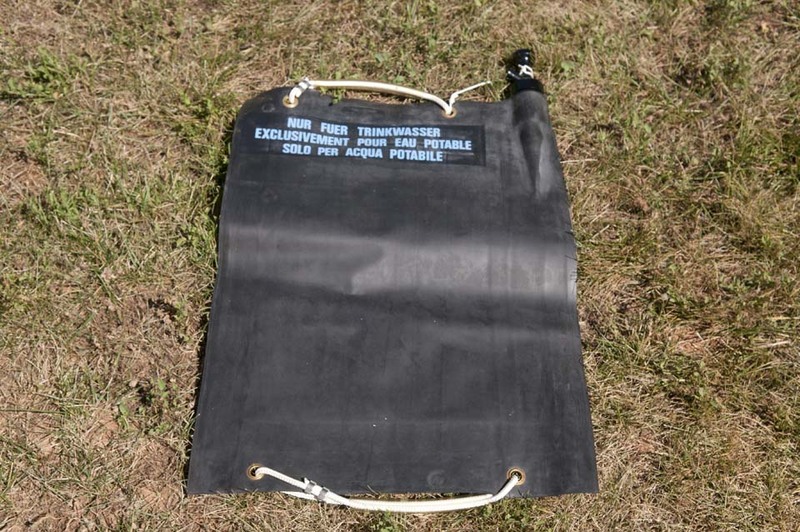 Not as good for volume storage, but useful for carrying or re-filling water for longer distances. Also great to have for an ATV to complement extra fuel cans (if you need extra fuel, you should have the capacity for extra water). They still aren’t cheap, but you can purchase them new if you look, and they will likely last for decades even if you abuse them. The blue, 7(?) gallon cubes from Walmart (similar to the Coleman pictured above) only last one summer in the Arizona sun, then they start to crack and shatter. Kept indoors they last. I assume this is from UV. YOU MAY BE ABLE TO REPAIR THOSE PLASTIC WATER CANS WITHOUT USING GLUE. I’M NOT SURE IF THIS WOULD WORK FOR THAT TYPE OF PLASTIC, HOWEVER, I’VE SUCCESFULLY REPAIRED MY PLASTIC ANTI-FREEZE COOLANT RESIVOIR IN MY JEEP WITH A SMALL SOLDERING IRON BY MELTING THE PIECES BACK TOGETHER. YOU JUST HAVE TO BE CAREFULL NOT TO DAMAGE THE THREADS. Thank you I will try that and let you know if it works.